This week it's Stitching, real of faux. The only real rule is that you must create a new christmas holiday, winter or Hanukkah card and means by Christmas there is no panic that you have none made! For this weeks challenge I choose faux! I have a lovely set of stitch stamps from hot off the press. 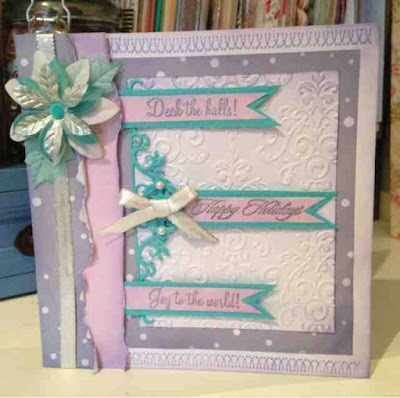 I used the pointsetia modern, the ribbon and the lilac paper from papermania and the teal paper is from making memories. I used a spellbinder die and a cotoure creations embossing folder. I cut the banners myself and the sentiments stamps were from the same hotp kit. This is my final week as guest designer for http://christmascardchallenges.blogspot.co.uk/. I hope you all enjoyed my creations!